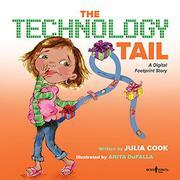 A girl learns about her “technology tail,” or digital footprint. The lesson is delivered by a preteen’s laptop screen that suddenly comes to life and starts speaking, telling the child (who has light brown skin and straight brown hair) about how online activities can follow users and influence the way people think about them. Understandably, much of the focus is on refraining from posting mean things online and being aware of others’ feelings, but there are also lessons on safety and security. It all boils down to a didactic lesson, taught in very uneven prose—the screen frequently speaks in verse with an abcb rhyming pattern but just as frequently doesn’t, and there’s no real rhyme or reason as to why it drops in and out of verse. Occasional moments feel more like curriculum bullet points than parts of a cohesive whole, such as a brief definition of “keyboard courage” (saying things online that a person would never say out loud) and running all posts through a “think” test (THINK corresponding to True, Helpful, Inspiring, Necessary, and Kind). At other points, concerns expressed feel older than those a rhyming picture book’s audience would share. Aside from mismatches between content and delivery, the disproportionate art style, featuring characters (of many races) with oversized caricature heads, further obfuscates the characters’ ages.